Below is a recording and a program note about the work. 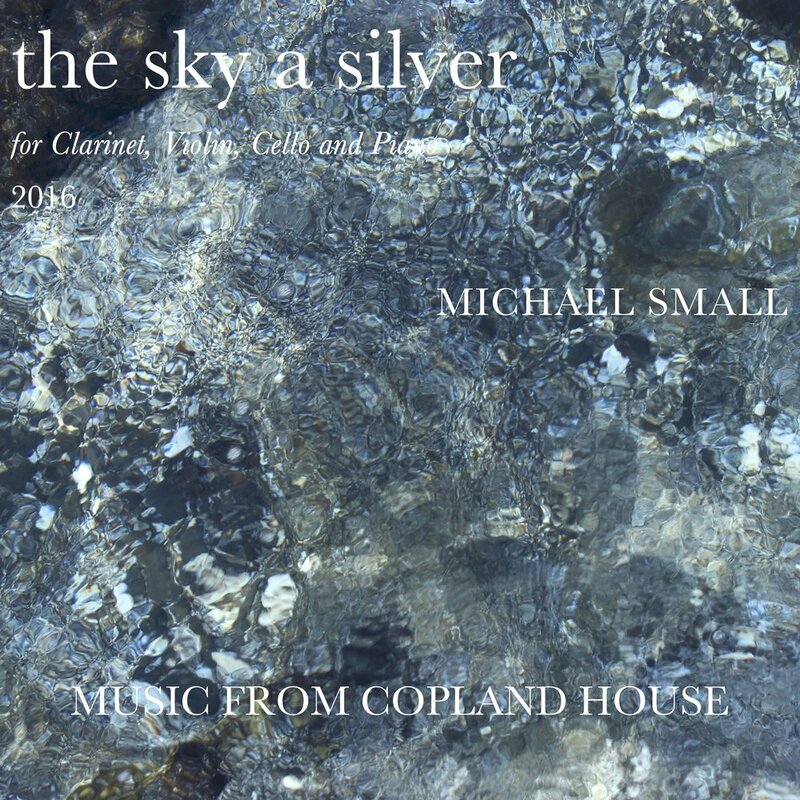 Michael works on “a sky a silver” with cellist Alexis Gerlach and violinist Harumi Rhodes. I'm becoming increasingly fascinated by forms which evolve more or less seamlessly. While I have also written pieces which are very disjunct and montage-like in character, I find that there is a discipline in following a single, unbroken narrative path, and this piece is a step in that direction. I'm also thinking a lot about textures and blocks of sound, superimpositions of lines. One technique I often use is that of "heterophony", where the same melody, or a series of similar melodies are piled on top of one another, creating a combination of movement and stasis. In the first section, several splintered melodies gradually coalesce underneath a very high, slow piano chorale. These disparate layers gradually pull together into a unison gesture which transitions suddenly into a new section. In an interview with George Benjamin, he speaks of thinking about compositional control like following a compass needle - he thinks about moments when a piece goes from being vertically focused (chordal) to being horizontally focused (perhaps melodic). I decided I would write my own version of this moment, and this resulted in the long clarinet melody which carries the piece into a wild, ecstatic climax. In the last few pieces I've written, I've pushed myself to write a seamless transition out of the highpoint (if there is one), into something radically new - something which develops logically and smoothly while nevertheless being carefully paced. In this piece, the coda combines aspects of the fast, melodic music and the shadowy, splintered melodies of the opening. When the piece was nearly finished, I happened on a wonderful poem by e.e. cummings whose images seem (in one reading, at least) to chart the music's shifting characters and moods, and so it seemed fitting to use it as a guide to the form of the work. My deepest thanks to the Music from Copland House ensemble for their hard work on my piece.